Manage an unlimited number of documents on your Mac. Is there a better alternative to Document Tracker? Is Document Tracker really the best app in File Management category? Will Document Tracker work good on macOS 10.13.4? 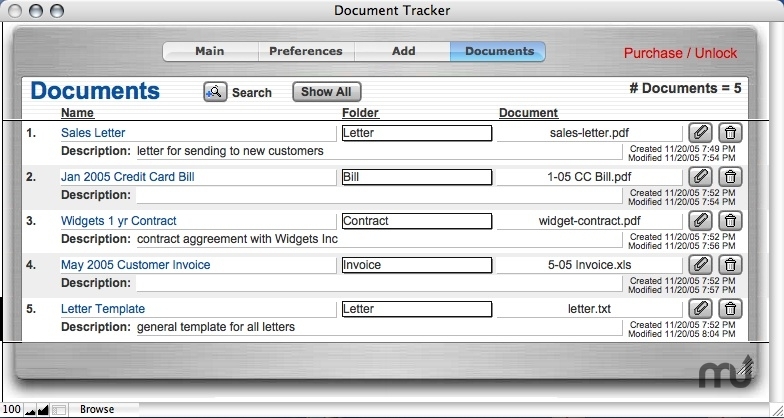 This application allows you to track and manage an unlimited number of documents on your Mac. It is simple to use, and scalable enough to hold millions of documents. Documents are actually stored on the hard drive of your Mac or remote network computer, and the name, description, folder, and reference to the file are stored in Document Tracker. The demo version is restricted to storing 10 documents. Store the documents on your local hard drive, or on a network drive that you connect to through Finder. Easy to use, point-and-click interface. Document Tracker needs a rating. Be the first to rate this app and get the discussion started! When adding or editing a document, you can specify what Folder to put the document in for easier retrieval. Add and remove folders to fit your specific needs. Search by name, description, or folder. Double-Click on file name to open and view your document.